Irony is a beautiful thing, and so is coincidence. 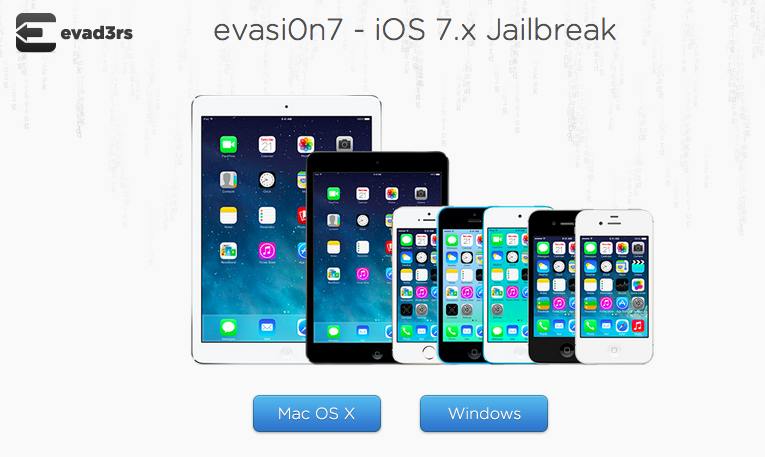 Only moments after publishing an article summarising the bleak state of the iOS 7 Untethered Jailbreak, the Evad3rs team just pulled a complete 180 and released the iOS 7 Untethered Jailbreak in the form of Evasi0n7. The new tools allows users to jailbreak all iOS devices running versions 7.0 to 7.0.4. However, Saurik – the creator of Cydia – has taken to Twitter to warn users that they should proceed with caution since most of the packages on Cydia, and Cydia itself for that matter, have yet to be tested with iOS 7. The release of a Jailbreak is extremely odd timing, especially since iOS 7.1 has been released. However, it is completely possible that given iOS 7.1 is said to fix the exploits used in the iOS 7 Untethered Jailbreak that the Evad3rs team took the opportunity to release a Jailbreak for users before iOS 7.1 comes out of Beta. The process is extremely straigthforward, and although the Evad3rs recommend that users erase their device using a full restore if they’ve updated to iOS 7.x OTA (Over-The-Air), there do not seem to be any major problems running the Evasi0n7 tool straight away, and Cydia seems to work pretty well given it’s an unofficial release. Head on over toevasi0n.comto download it now, or hit up the direct links below. So if you’ve been waiting for an iOS 7 Untethered Jailbreak then the wait is finally over, that is until iOS 7.1 is released, but be sure not to update!